Seaweed is a loose term encompassing many different types of ocean and sea growing aquatic plants, kelp being one of them. 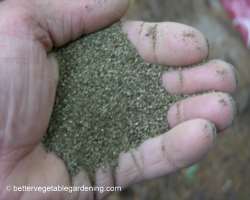 Seaweeds are some of the best soil amendments available for adding to gardens of all types. While seaweed extracts do contain small amounts of macro nutrients their main value is as a growth enhancer, packing 60 trace elements, amino acids, and vitamins essential to plant growth in its arsenal seaweed stimulates plant growth by helping them absorb nutrients more effectively. Seaweed products are often mixed with fish products to give a complete natural fertilizer and soil amendment that supplies every nutrient and trace element needed for soil health and maximum plant growth. There are 3 forms of seaweed products. The better quality liquid kelp products on the market are either enzymatically digested or cold processed. Like fish fertilizer, liquid kelp products processed in this manor usually have higher levels of growth hormones than extracts using excessive heat or chemicals in the extraction process. Seaweed meal is made by first cleaning and eliminating salt, it is them dried and ground into the finished product. Kelp powder is similar to kelp meal but ground fine enough to be water soluble and applied as a foliage spray or injected into an irrigation system.